Yesterday I made a mold of Sonny's two head halves and the jaw. The mold material is RTV rubber, which is flexible and doesn't stick to anything except itself. But because RTV is a flexible rubber, you can't cast into it unless it has a rigid foundation. That foundation is called a mother mold. Mother molds can be made from any medium that is pliable when wet and sets up hard. You can use plaster of paris, plaster bandages, paper mache, fiberglass, and so on. I chose a product called Plasti-Paste for this project. It has all the properties needed for a mother mold plus it is non-toxic and sets up in only 90 minutes. Normally I'd use something less expensive for a project that involves only one casting, but I'd never used Plasti-Paste, plan to use it for my Ricky-Tik project, and wanted to learn how it works. 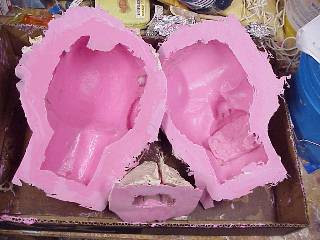 Here's Sonny's head parts with the mother molds added. 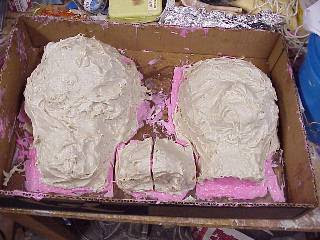 After the mother mold hardened, I removed the original head sculpture from the molds and put them away. Here are the molds themselves flipped over and ready for a casting to be added. I have several choices for a casting medium. Paper mache, MagicSculp, Epoxy Sculpt, fiberglass, and playurethane. I am certain to use urethane to cast the jaw since its inner details, such as teeth, would be difficult to get to using a hand-cast medium. The jaw needs to be poured. I slush-molded two head halves with urethane in the first stages of the Ricky-Tik project, and it isn't easy. Consequently, I haven't decided whether Sonny's head will be urethane or a medium that is easier to work with.